Ya paso el desfile de StockShow en Fort Worth y las Escaramuzas "Las Guadalupanas" y "Las Coronelas" lucieron muy bien su atuendo de adelitas FELICIDADES!!! y que se un ejemplo para los otros equipos. I am going to be at Bajio tomorrow, Sunday January 16, between 3 p.m. and 5 p.m. I will be taking application pictures for anyone who wants them. No charge. I will have the copies ready at Bajio on Monday, January 17after 5 p.m. Also, the charreada at LaForteleza is canceled due to rain. We really need a covered lienzo. We all need to work for this. Aun No se me ha informado la fecha limite para federar en Febrero, estoy pendiente de tal. gracias. Sorry, but the January 9, Charreada had to be canceled due to rain. We really need a covered arena. It has been rescheduled to January 16. Will be there to raise money with the 50/50 raffle. 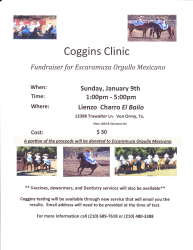 Hope to raise a lot of money to help injured Charros. 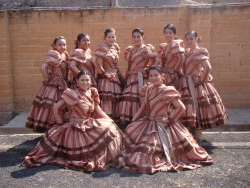 The Charros de Bejar, are going to have a 50/50 raffle on Sunday, at Melecio Flores Charreada. Tickets will be $1.00. We will sell tickets during the chareadas and at the end, a drawing will be had. The winner will receive 50% of the money paid for tickets and the other 50% will go to the Injured Charro Fund. So the more tickets you purchase, the more the winner will receive. Hope it is you! La Escaramuza Orgullo Mexicano los invita. COGGINS CLINIC. ESTE DOMINGO 9 DE ENERO DE LAS 1:00 PM ALAS 5:00 PM EN EL LIENZO CHARRO EL BAJIO UBICADO EN 13398 TRAWALTER LN. VON ORMY, TX. COSTO POR COGGINS $30. TENDREMOS SERVICIO EXTRAS COMO VACUNAS, DEWORMERS Y DENTISTA. GRACIAS POR TU APOYO LOS ESPERAMOS..
Que bonito tener este sitio abierto otra vez, bueno muchachas solo para desearles suerte a todas en este año que nuestros planes nos salgan bien, que todos los equipos nos comportemos como unas damas que somos y esperemos en dios que sea una temporada llena de triunfos y satisfacciones tanto personales como por equipo SUERTE!!!!! Se les hace una invitacion a todas las damas interesadas en formar parte de una escaramuza…La escaramuza charra Las Generalas…nos gustaria mucho poder participar en competencia este año 2011 y necesitamos integrantes para completar nuestro equipo. Si estan interesadas pueden comunicarse con Alma Flores al 210-897-5713. 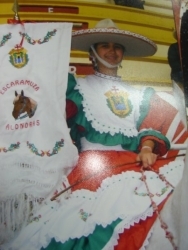 ARTICLE 63: "It is important that we dress appropriately respecting the charro traditions. 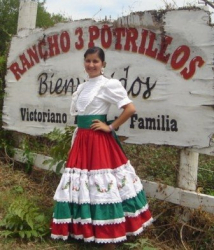 The following are prohibited in part or in whole: to combine the charro wardrobe with jackets; or western accessories or civilian clothes; to let down your hair; dress only partially in your wardrobe; use sunglasses; exhibit yourself in undergarments; use caps or non-charro hats; use ornamental piercings visible on any part of the body other than the ears. We should be an example worthy of our wardrobe and display it appropriately." Anyone who wants to ride in the San Antonio Stock Show and Rodeo Parade on January 29, needs to contact Randy Janssen at 846-8757 for the forms before January 15. Also the Charros de Bejar will be in the Battle of Flowers Parade, and if you want to ride in it you need to sign up and have a coggins test before March 1. Only 20 spaces are available. Se solicitan damas para completar equipos en: SAN ANTONIO TX, BURLESON TX y HOUSTON TX. Porfavor de mandar un email para mas informes. I am so excited that we have so many new teams and so much escaramuza activity going on that I have reconsidered the use of the Message Board on our site. Please use it to post your fundraisers, team activities, ferias and positive words of encouragement to other teams. Please Be Kind and Respectful, I do not want to have to remove it permanently. It is for the use of ALL ESCARAMUZA in TEXAS! glad to see the message board is up again! !